Israel demolished 20 percent more Palestinian-owned homes in Jerusalem in 2018 compared to 2017. Israeli authorities presented Ayman Naim Kawasbeh of Jerusalem with a terrible choice in October 2018: demolish your own home or pay 40,000 shekels (10,000 dollars) for Israeli forces to destroy it. After demolishing his own home, Kawasbeh lamented, “We live a real-life tragedy. Winter is around the corner and we have no home, no shelter. I don’t know what I will do in the coming days.” Eight people, including five children, lived in his home in Jerusalem. Israeli forces unexpectedly arrived at Hanadi Abu Rammouz’s door and abruptly demolished her apartment in Jerusalem in February 2017. She described the conduct of the Israeli soldiers: “Immediately after storming into our house, they evacuated us by force and prevented us from taking out personal items. They did not even allow us to drink water. The soldiers threatened my husband with their weapons and pointed them at his stomach.” This demolition displaced seven people, including five children. The United Nations (UN) 1947 Partition Plan for Palestine declared Jerusalem a “corpus separatum,” meaning as an international city that would be administered by the UN. However, in 1948, Zionist paramilitaries and Israeli forces captured West Jerusalem and 40 nearby Palestinian villages, along with 78 percent of Historic Palestine. Palestinians call this event the Nakba, meaning “catastrophe.” During the Nakba between 750,000 and one million Palestinians were expelled from their homes, including between 64,000 and 80,000 in the Jerusalem area. In 1967, Israel captured the remaining 15 percent of Jerusalem and expelled another 26,000 Palestinians from the city. Israeli authorities quickly implemented policies to institutionalize the military occupation and establish a Jewish majority in Jerusalem. Israel formalized its 1967 annexation of East Jerusalem in 1980 when it passed Basic Law: Jerusalem, Capital of Israel. In December 2017, U.S. President Donald Trump also legitimized the annexation when he recognized Jerusalem as the capital of Israel. The international community affirms Jerusalem’s Palestinian residents as protected under the Fourth Geneva Convention. The UN Security Council maintains that all legislative measures and actions taken by Israel to alter the character and status of Jerusalem are null and void under UN resolutions 242, 267, 471, 476, 478. Shortly after capturing East Jerusalem in 1967, Israeli forces demolished the Moroccan Quarter (Harat al-Maghariba) in the Old City, a roughly 10,000 square-meter neighborhood that was home to 650 people and two mosques. Many of the residents who were forced to flee the neighborhood ended up in Shuafat Refugee Camp, north of Jerusalem. The residents who lost their homes were issued eviction and expropriation orders only months after demolitions took place. In place of the Moroccan Quarter, Israel built what is known today as the Western Wall Plaza. In recent years, only eight percent of all building permits in the city were issued to Palestinian neighborhoods, according to the Israeli human rights group Ir Amim. As a result, Palestinians build without permits to avoid overcrowding. The Association for Civil Rights in Israel found that 20,000 homes in East Jerusalem – or 39 percent of all homes in East Jerusalem – lack Israeli construction permits and therefore live in perpetual threat of abrupt homelessness. In 2011, I applied to get a permit to build a home for four family members. I submitted all the necessary documents and the municipality rejected my request. Because of the urgent need shelter my family, I built the home. I paid 60,000 NIS in fees for doing so. Then in the beginning of 2017 Israeli authorities took me to court and issued a demolition order for the house. I paid another 25,000 NIS to the municipality to postpone the demolition. But, on April 4, 2017, the court ruled in favor of demolishing my house and Israeli forces carried out the process. 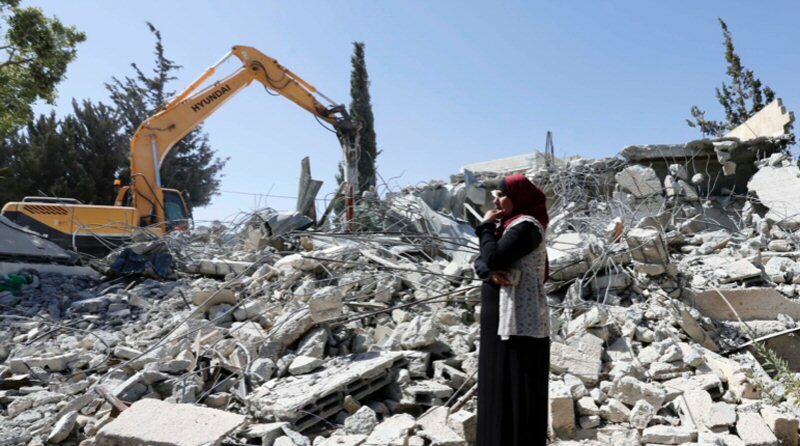 Israel demolished approximately 20 percent more Palestinian homes in 2018 compared to 2017, according to data published by the United Nations Office for the Coordination of Humanitarian Affairs (OCHA) in the occupied Palestinian Territories. This latest increase is in line with an emerging trend: Israel progressively demolishes more Palestinian-owned homes in the holy city. In five years, Israel has demolished 785 Palestinian-owned structures in Jerusalem. In 2018, Israel demolished 177 Palestinian-owned structures in Jerusalem. The number of demolitions for previous years are as follows: 142 in 2017; 190 in 2016; 79 in 2015; 99 in 2014; and 98 in 2013. If Palestinian families do not demolish their homes themselves after receiving a demolition order, the Israeli municipality informs them that they nevertheless have to evacuate the house and pay 40,000 for Israeli forces to carry out the demolition. The realization of these settlement plans would sever the northern West Bank from the southern West Bank with a contiguous block of settlements stretching across its center. Dividing Palestinian cities, towns and villages into restricted enclaves flanked by settlements on all sides is key to maintaining what Israeli authorities euphemistically call a “demographic balance” in Jerusalem – that is, restricting the Palestinian population to 30 percent of the city’s total population. Increasing rates of demolitions in Jerusalem suggest that US President Donald Trump’s decision to transfer the US Embassy from Tel Aviv to Jerusalem has emboldened Israeli authorities to realize their settlement plans in defiance of Palestinian life.